Samsung Electronics wants to turn even old clunkers into smart cars by plugging dongles running the Tizen OS into their diagnostics ports. The Samsung Connect Auto dongle contains an LTE modem, a Wi-Fi hotspot, a GPS receiver and a tiny computer running Tizen, and connects to a car's on-board diagnostic system via the OBD II port under their steering wheel. The company will show it at Mobile World Congress, which runs Monday through Thursday in Barcelona. Samsung is touting the dongle as a way to improve driving behavior, increase fuel efficiency and keep passengers entertained. It provides a way to upgrade older or cheaper vehicles with the kind of connectivity found on newer, top-of-the-range vehicles. 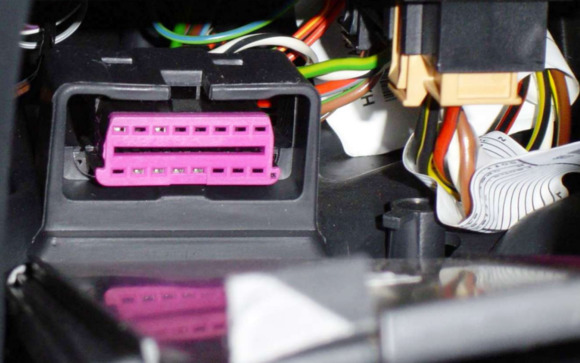 The OBD II port is a handy place to plug in a dongle like this: In addition to providing information about the vehicle's engine performance and fuel consumption it also supplies 12-volt power and, unlike the lighter socket usually used for powering in-car gadgets, is out of the way. The ports have been mandatory on new U.S. vehicles since 1996, while the European Union began introducing such obligations in 2000. The Samsung Connect Auto will go on sale before the end of June in the U.S., with AT&T as its first wireless service provider, Samsung said. This isn't the first OBD II-powered Wi-Fi hotspot for AT&T, though: Last September, it began selling the ZTE Mobley for $100, or free with a two-year service plan. While ZTE's Mobley has only one function, providing Wi-Fi Internet access, Samsung sees its dongle as far more than just a cellular modem. It plans a collection of related products and services through partnerships with companies such as insurance giant Axa, car rental firm EuropCar, and Agero, developer of the Blink roadside assistance app. Automobile manufacturers are noticeably absent from Samsung's initial list of partners and may be wary of encouraging drivers to plug unapproved devices into the OBD port. Ford, for example, warns on its website that "aftermarket OBD-II wireless transceiver diagnostic devices may interfere with various vehicle systems." There are plenty of such devices on the market, typically equipped with serial ports for connection to a PC or, in more modern ones, Wi-Fi or Bluetooth connections allowing smartphone apps to provide real-time reports on engine performance. Samsung's ambitions for its dongle are a little broader. The applications it envisions for Samsung Connect Auto include usage-based insurance, fleet management, "find my car" functions and emergency alerts to a driver's contacts in case of accident. The company's software development kit also provides geo-fencing and driver-rating algorithms for programmers to incorporate into their apps. Apps could also be used to generate automatic expense reports for business mileage, the company suggests. Many of these services can already be delivered by stand-alone apps running on a smartphone carried in the car, but diagnostic information straight from the car could add another dimension. Cloud-based monitoring of the OBD port's diagnostic messages will allow Samsung to go beyond the car's "check engine" warning light, providing a "virtual mechanic" service with recommended maintenance and repair options from a specialized network of partners. Samsung is eyeing the automotive market for other possible applications of its technology: At Mobile World Congress it will also be demonstrating a concept parking prepayment service in partnership with enterprise software developer SAP and Spanish automobile manufacturer Seat.